Indian Journalist’s Murder: The Ultimate Form of Press Censorship? “Gauri Lankesh’s death is another stark reminder of how violence is the new normal (in India).” –A senior journalist. BHUBANESWAR, India, Sep 7 2017 (IPS) – Dauntlessly crusading against curbs on freedom of speech, fifty-five-year-old Indian journalist Gauri Lankesh was gunned down at her very doorstep in Bengaluru city on the evening of Sep. 5, taking three bullets of the seven fired in her lungs and heart. She was shot from just three feet away. 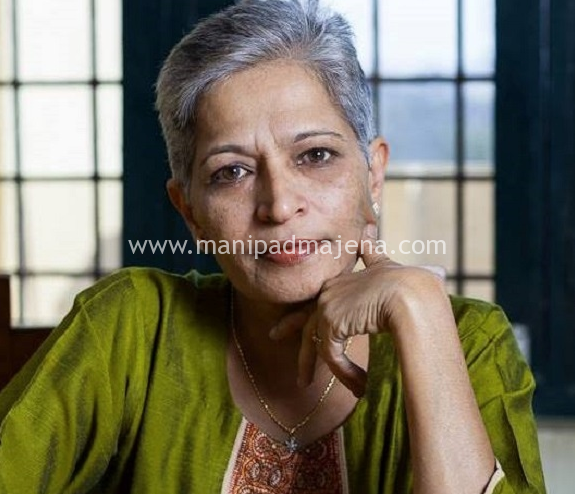 Known for her vocal stand against India’s growing right-wing ideology, communal politics and majoritian policies, Lankesh ran bold and forthright anti-establishment reports on the eponymous Gauri Lankesh Patrike, a regional language tabloid published, owned and edited by her since 2005. She ran the paper only on subscriptions from loyal readers from across remote villages of Karnataka State. The paper carried no advertisements, following in the tradition of her socialist poet, playwright and journalist father who started the original tabloid. Gauri Lankesh described herself on her Twitter handle as a journalist-activist. Fluent in both English and the regional Kannada language, she fearlessly broadcast her far-left of centre and pro-Dalit ideologies against religious fundamentalism and the caste system, reaching a huge mass grassroots population. Speaking at her funeral, Karnataka’s chief minister M Siddaramaiah said, “Gauri brokered deals with Naxalites (Left-wing extremists) in Karnataka. She helped them enter the mainstream and played a vital role of a negotiator between the State and the extremists.” An activity which extremists cadres may have wanted to halt, Lankesh’s brother Indrajit Lankesh said today. Known as a sympathizer of left-wing extremists, Lankesh was among the few who could empathise with the poverty, oppression and injustices that had pushed these people to pick up arms against the government. In November, Lankesh was convicted in two libel suits filed by the ruling Bharatiya Janata Party (BJP) parliamentarians for her 2008 article alleging that they had criminal dealings. She was, however, granted bail and was planning to appeal to a higher court. Lankesh’s voice being silenced once again highlights that journalists covering politics and corruption in India are most at risk of being silenced by killing. Over half of the 27 journalists murdered in the country since 1992 were covering politics and corruption – the two beats most likely to provoke violent repercussions, finds the Committee to Protect Journalist (CPJ). The threat from these seems to be rising. India continues to languish in the bottom third of the 2017 World Press Freedom Index, ranking 136th of 180 countries. Among India’s neighbours, many fare better, including conflict-torn Afghanistan at 120, Pakistan at 139, Sri Lanka at 141, Bangladesh at 146, Nepal at 100, Bhutan at 84 and China at 176. Norway leads while North Korea is at the bottom. The Index ranks countries according to the level of freedom available to journalists. It is a snapshot of the media freedom situation based on an evaluation of pluralism, independence of the media, quality of legislative framework and safety of journalists in each country. A friend of the slain journalist who was also from the media fraternity is quoted as saying that Lankesh was very “in your face” in her brand of progressive activism against radical Hinduism. “Our right to dissent is being threatened,” the intrepid journalist said instead. “Given the ways in which speech is being stifled, dire days lie ahead,” Lankesh told an online portal a few months before her death, in an intuitive foretelling of her violent end. She installed two closed circuit surveillance systems a fortnight before the fatal attack. No link has yet been established between her death and her ideology or writing by police investigations, but because she so fiercely fought for freedom of speech and freedom of thought, large sections of Indian media protesting her killing are expressing concern over what they described as a growing intolerance of dissenting political voices. The Reporters without Borders (RSF) 2017 index report too blames the rise of Hindu nationalism for India’s drop in ranking. “The three-year-old (federal) administration has been trying to banish all “anti-nationalist” discourse from the Indian press. Hundreds of journalists are murdered, but in nine out of 10 cases their killers go free. CPJ finds it is most often criminal and political groups, government officials in India who get away with journalist murders. Rural and small-town journalists reporting on local corruption, crime, and politics are targeted most. Worse, in addition to failing to solve any journalist murder, India has never responded to UNESCO’s requests for the judicial status of journalist killings in the country. Impunity is widely recognized as one of the greatest threats to press freedom. The Impunity Index finds globally, 95 percent of victims were local reporters. More of them covered politics and corruption than any other beat. Also in 40 percent of cases, the victims reported receiving threats before they were killed. Threats however are rarely investigated by authorities and in only a handful of cases is adequate protection provided. Of serious concern is CPJ’s finding that only 3 percent of total murder cases over the 2006 – 2016 decade have been brought to justice, including the prosecution of the masterminds. No data on the murder of journalists is maintained separately, according to India’s home ministry, which administers law and crime. Since 2014 the national crime records bureau (NCRB) has however started collecting data only on grievously injurious attacks on media persons. The federal or any of the State governments is yet to act on RSF’s 2015 call to the Indian government to launch a national safety plan for journalists, or at least establish alert and rescue mechanisms that would also send a strong message of support for media freedom. India’s information and broadcasting ministry rejected RSF’s index ranking earlier this year, saying it found the sampling random in nature and it does not portray a proper and comprehensive picture of freedom of the press in India. Earlier in February U.N. Secretary General António Guterres agreed to take steps to address the safety of journalists, at a meeting where RSF and CPJ called for the appointment of a special representative to the UNSG to end impunity, ensure safety. With 34 countries and more than half the world’s population, the Asia-Pacific region holds all the records including the biggest number of “Predators of Press Freedom,” according to RSF. Earlier this week, the English-language The Cambodia Daily newspaper published its last issue on Sep. 4 after fighting for the right to report the news freely and independently for 24 years. It was forced to close by an unprecedented form of government pressure – a sudden demand to pay 6.3 million dollars in alleged back taxes, according to RSF. The newspaper’s editor, Jodie DeJonge regards it as arbitrary and politically motivated, pointing out that no tax audit had been carried out, according to RSF, which also says that The Cambodia Daily has been one of the relatively few independent media outlets to cover corruption, deforestation and other stories that are embarrassing for the government. This clampdown on independent media outlets has come as Cambodia prepares to hold elections next year. “But this is not a tax issue, it is a free press issue,” DeJonge told RSF.